It’s high season for politics. Yes, we are back to balancing campaign trail accusations with attack ads, as well as parsing the meanings of sound bites and polls. It would seem as though not much is actually happening in Washington, but that’s not completely true. Despite the rhetoric, there is some action on Capitol Hill – and it’s not a battle over taxes, it’s about treaties. For the historians, between 1946 and 1999, the United States completed nearly 16,000 international agreements. Only 912 of those agreements were treaties, submitted to the Senate for approval as outlined in Article II of the Constitution. Thanks, Wikipedia. A UN treaty does not supersede national laws. Specifically, the UN has no capacity or ability to threaten a country’s sovereignty. Ratifying a UN treaty does not force the U.S. to change its laws. However, in today’s debates over treaties, some detractors would have you think otherwise. This spring, the Senate Foreign Relations Committee held hearings that highlighted the need for the Senate to pass the UN Convention on the Law of the Sea (UNCLOS). The treaty is a set of rules, negotiated to govern the use of the world’s oceans. Some have called it the Constitution for the Ocean. It defines maritime zones and boundaries; creates legally secured navigation and resource usage rights; and sets standards for protecting the marine environment, sustaining fishing stocks, and preventing pollution from land and air sources. Those who object to U.S. ratification contend doing so would surrender U.S. sovereignty, result in what they call a “UN tax,” or restrict activities of the U.S. Navy. All three claims are untrue: joining the treaty would actually increase U.S. ocean territory by 4.1 million square miles; the U.S. would incur no taxes, and UNCLOS has no jurisdiction over U.S. military activities. The committee heard from the secretaries of State and Defense and the Joint Chiefs of Staff, who asked for a positive vote. On another occasion, the committee hosted a “24-star hearing,” with six four-star Generals and Admirals testifying in favor of passage. In a third hearing, the CEOs of the U.S. Chamber of Commerce, Verizon Communications, National Association of Manufacturers, and the American Petroleum Institute added their support of the Convention. Numerous types of environmental groups have lined up in support as well – so yes, big oil and the business sector are in the same boat with the environment lobby for UNCLOS – how often does that happen? We’ve had 30 years to chew over the details and with this overwhelming cross-sector support – why not pass the treaty? Here’s where I clench my fists and say – why can’t our members of Congress just use a bit of common sense? Senator John Kerry, the chair of the Senate Committee on Foreign Relations, has told everyone that he won’t bring a vote forward until after the election to avoid politicizing the treaty. Despite this, 34 Republican Senators sent a letter to Kerry two weeks ago to indicate their intention to vote against ratification of the treaty. Welcome to politics. A pre-emptive strike so to speak. Let’s see what happens post-elections. Stay tuned. UNCLOS may have lost a bit of steam, but Kerry, a sage politician, quickly put forward the Convention on the Rights of Persons with Disabilities (CRPD) for committee consideration. This UN agreement is an international human rights instrument intended to protect the rights and dignity of persons with disabilities. Parties to the agreement are required to promote, protect, and ensure the full enjoyment of human rights by persons with disabilities, and ensure that they enjoy full equality under the law. 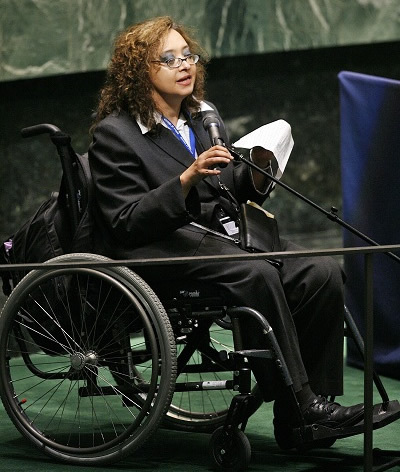 The CRPD came into force in 2008 and requires countries to ensure equal treatment for the disabled, as well as take action to stamp out discrimination in access to justice, health care, education, and employment. The Convention, was inspired in large part by our nation’s own cutting-edge disability rights statutes—particularly the landmark Americans with Disabilities Act (ADA)—which just celebrated its 22nd anniversary. So the U.S. should be first in line to sign-on, yes? Not yet. As of July 2012, 153 signatories and 117 countries, including many of our nation’s key allies—such as the U.K., Canada, Germany, Australia, Italy, and South Korea—have formally joined the Convention. But the U.S. has not. The Senate took a major step forward on CRPD last week when the Senate Committee on Foreign Relations passed it – on July 26th, the anniversary of the ADA – and it now rests with the full Senate for ratification. With a strong push from organizations like ours and those in the Disabilities community, we believe we can get it to the floor for action in the next week before the August recess. Ratification of CRPD will signify an important moment in U.S. global leadership on the issues that matter most. Yet there’s much more to do in the Senate. Don’t get me started on a few of the other treaties we haven’t ratified, such as the UN’s 1979 Convention on the Elimination of All Forms of Discrimination Against Women (CEDAW), which functions as “an international bill of rights for women.” All developed nations except the U.S., and 186 countries in all, have ratified CEDAW. There is also the 1989 Convention on the Rights of the Child (CRC), which focuses on protecting children, ensuring their access to education and health care, and providing them a safe upbringing that takes their best interests into account, all without discrimination. The United Nations Children’s Fund describes CRC as the “most widely and rapidly ratified human rights treaty in history.” Only the U.S., South Sudan (a country that has only existed for one year), and Somalia (which lacks a functioning government), have not yet ratified the treaty. While there is plenty of work yet to do on treaties, we should call the committee passage of the Convention on the Rights of Persons with Disabilities an important first step. My entreaty to the Senate is this: keep moving. Let’s show our leadership in the world through our participation in these vital international agreements.